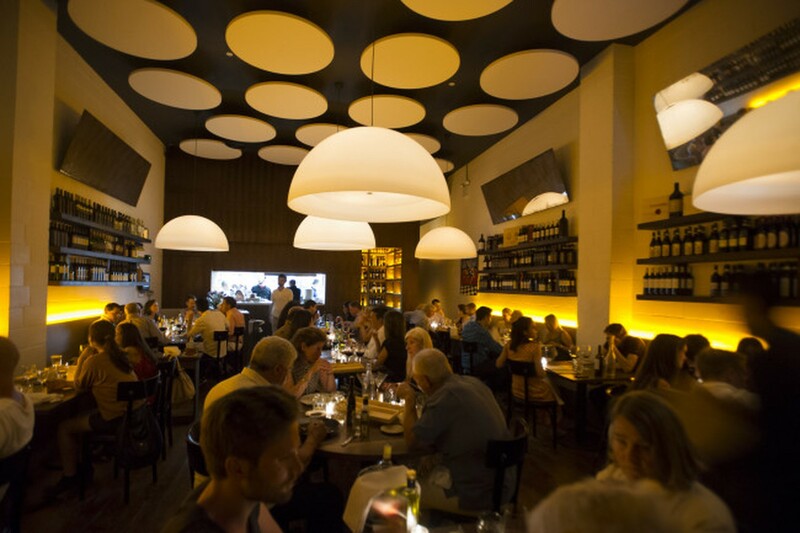 As you are deciding whether or not to have a meal at Antica Pesa, it would be smart to consider a few things, like, "Am I hoping to see an Olsen twin tonight?" or, "Will I enjoy non-stop attention from an Italian guy with a pony tail?" It's also important to decide whether or not you're looking for a sleek, "Scarpetta in Williamsburg" feel to your evening, because that's what goes on here. Basically, Antica Pesa is a trip, and it's one you need to be prepared for. We had not considered any of those things before our visit to Antica Pesa, and were a bit caught off guard by what came at us. First of all, this is a beautiful restaurant that probably cost well into the millions to design and decorate. Not something you'd typically find on a random stretch of Berry Street. Second, the staff here is very intense. Antica Pesa has a sister restaurant in Rome, so this place is full-on Italian in both attitude and passion for what they do. We love that, but prepare yourself for lots of firm handshakes, and a guy in a $3,000 suit and neck scarf who insists on doling out the pasta portions among your table himself. All in all, it's both crazy and endearing, and a far cry from some of the other restaurants around here that hand you some food and a paper napkin and then wait for you to leave. As for the food at Antica Pesa, we generally enjoyed it, but also found it to be the least memorable part of the experience. It's entirely possible that we've just become accustomed to the New York City version of Italian cuisine, and this authentic Roman stuff is too subtle and nuanced for our overactive taste buds. It's also entirely possible that Antica Pesa is just a bit hit and miss. There were a few items that we really liked on this menu, and then there were some simple things, like Cacio e Pepe, that seemed poorly executed. At the end of the day, we probably won't rush back to Antica Pesa for a full blown meal, but we'd happily come grab a drink and a seat by the fireplace at the bar. If only to catch a glimpse of the staff when one of the many celebrities that apparently frequent this place walks in. We imagine lots of touching. Prosciutto di Parma and fresh mozzarella in a filo dough crust. This is basically the best f*cking Hot Pocket you've ever eaten. Order it. We're probably not the best judges of true Roman authenticity here, but we've never seen a Cacio e Pepe with so much cacio. It was more like a really peppery mac and cheese than anything else. We liked this pasta more than the Cacio e Pepe, mostly thanks to some guanciale and a nice spicy kick. An artichoke ravioli that we liked, but didn't love. Again, this might be a Roman thing, but we found the pasta to be a little thick in this situation, to the point that it dominated the artichoke flavors. This dish is a piece of market fish that comes with a thick crust of sunflower and pumpkin seeds on the skin. Can't say we've ever seen something like that before, and it sort of blew our minds. The fish (Arctic Char in our case) was perfectly cooked, and that nutty crust was the best part. You want this if it's available. Roasted rabbit stuffed with sausage and broccoli rabe, wrapped in smoked bacon and served with concord grape sauce. Sounds like a mouthful, right? It is. We liked the flavors here, but each rabbit medallion was kind of hard to eat. Once you get your fork on it, things sort of fall apart. D.O.C. is a casual Italian wine bar in Williamsburg.